The instructions are divided into five categories -use the links above. This is a good general order for updating records but your own agenda should be based on your individual needs and priorities. Special Forms Government agencies, financial institutions, and other formal entities often have their own special forms and requirements. In Person Appearing in person at local offices to make changes is effective (and in some instances mandatory). Letters Name change letters are available in the Forms section. Internet Visiting a company's website is a good way to find out procedures and if a special form is required it can often be downloaded. With online accounts and memberships you may be able to update your profile by logging in. 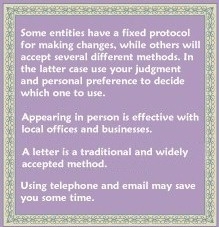 Email / Telephone These methods can save you some time when written notice or proof of your new name is not required. What names am I allowed to use? Generally you're allowed to use any name you want as long as it doesn't involve fraudulent intent, trademark infringements, or vulgarity. If you're going with a non-traditional option it's a good idea to have it approved by your local marriage license authority since rules vary in different areas. What if my marriage certificate does not show the name I want to use? In many areas it's normal for the marriage certificate to show just the couple's previous names, so this shouldn't be a problem. However, if you specified your new married names on the original marriage license application and then wish to change them to something other than what appears on the marriage certificate the SSA might not accept it*. How long after my wedding do I have to change my name? There's no time limit for using your certified marriage certificate to change your name with the Social Security Administration (it's good for as long as you stay married). What records should I change first? Most brides will update their most important records first which usually includes government and financial records. Benefits plans often have a special period for making policy changes (commonly 30 days following the wedding date) so these will need to be addressed promptly if you want to add your spouse or modify coverage. How long will it take to update my records? After you get the most important records out of the way it will be up to you as to how fast to update the less crucial ones. It might take a while before everyone gets the message and you'll probably get mail addressed to your former name for some time to come. Must I change my name on all my records? Apart from situations where an agency or organization requires your official name you may opt to keep some records in your former name if the time and effort involved with changing them outweigh the benefits. Some that might fit this category are old school transcripts, deeds and contracts, and seldom used memberships. Some brides continue using their former names in business and other situations. * Changing your name with the Social Security Administration is the most important step in the name change process. For questions and concerns in this area you should contact your local SSA office.